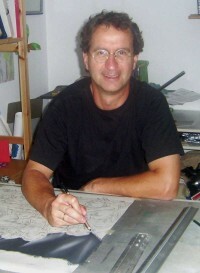 Klaus Busch was born 1965 in Limburg, Germany. He grew up in Wetzlar, Germany. High school graduation, studies and university degree in urban planning, including a fundamental education in technical and spatial drawing in Giessen and Oldenburg (Oldb. ), Germany. Attended courses in different techniques of drawing and graphic reproduction. Working as city-planner and freelance artist. Living in Deggendorf (Bavaria), Germany, since 1994, married, father of 3 sons. „Magical fables and furious malice: both is connected with Klaus Busch.“ This the Munich Merkur wrote 2014 on the occasion of the biennial „ARTiges“ at Ottobrunn near Munich. That surely points out the essence of my artwork. Operating in the border zones of painting drawing and caricature, my works aim to tell stories, to promote a discussion, maybe to offend and rise protest. But they do not hide one or the other wink and tell their stories by stringing together real impressions in unreal worlds. This sometimes upsets policy, church and society. Or, as Peter Glotz said: “Paintings and drawings of Klaus Busch are an invitation to take a walk with the eyes. The viewer easily forgets that he is viewing a flat surface, because the elaboration of the plastic qualities of things and their inclusion in the perspective are two major means that Klaus Busch uses to stage his fantasy world. The paintings contain a melancholy, but not without confidence. Well-known and familiar motives are mixed with unreal, but these are drawn as if they were really to grip in the tangible space. In this extraordinary world time is visible because everything takes time and must be experienced. It takes a second look." A common feature and main focus of the oeuvre is the using of pastel chalks, a technique not widely used in the artistic world. The uncommon accurate approach to this technique lead to some jury-selections into international and national exhibitions and some awards during the last years. Klaus Busch is member of the Professional Association of Visual Artists (BBK), section Lower Bavaria, and member of the artist group IMAGO. Furthermore member of the art associations Deggendorf and Plattling. Numerous joint exhibitions with the associations and groups in Germany, Austria and the Czech Republic.